My parents were visiting over the holiday weekend and Stewie had to stay upstairs because their dog, Wally doesn't like cats. 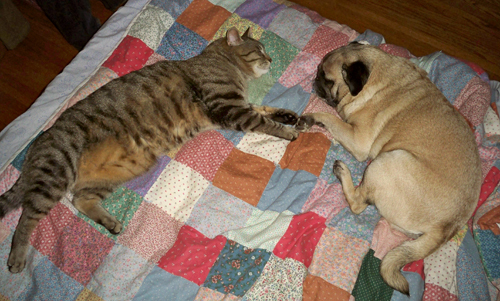 When my parents left I think Oscar and Stewie were happy to be reunited. 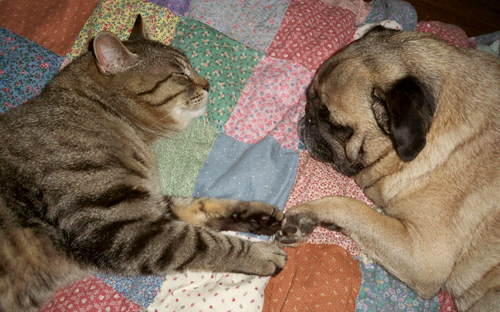 Look at them holding paws! We are "doggie & friends" from Hong Kong. "doggie & friends" is our own design with 10 styles dog designs as : Pug, Chihuahua, Schnauzer, Pomeranian, Franch Bulldog, Toy Poodle, Shih Tzu, Pekingese, White Terrier and Goldenretriever. Now, we designed wallet collection for Pug Lovers. Are you like them? Hmmm. All I wanted to say was "Awwww..."
He and Oscar are so darling.